It’s a been an eventful autumn for Geometra, with a large update for our website, several releases to our application and the start of our move to new offices. For the November release we’re focusing a bit more on some tweaks and minor feature additions. As we go along trying to clean up the feedback and add the features or solutions to problems that users have suggested. Some of these have been long awaited and some might open up new ways to use Geometra. Quality of Life improvements (QoL) is just as important to us as feature development and design so for now we offer you the following updates. As we’re starting to round up our year of development we can happily announce that we’ll be bringing at least one more feature to Geometra this year, quite possibly within a week or two. The Tiles feature which will allow you to calculate tiles and seam length/volumes for your area values on Area, Reduction, Circle and Freehand. Sorry this took so long, but it’s in now! You’ll find it under the new blue key button in the top right of the AppBar. Estimate view will now open to current page from preview on Drive meaning you no longer have to find that page again from the Drive. You’ll now be able to see all the annotations you’ve created on the preview in Drive before choosing which file to open. This will help you gauge how far along in your work you’ve gotten and where to pick up next. We’ve changed the icon representing scales to clear up some confusion some users had mixing scales with lines. We hope this’ll help differentiating between them more easily. Dim X (DX) and Dim Y (DY) are now available as variables to use for the Annotation Rows. 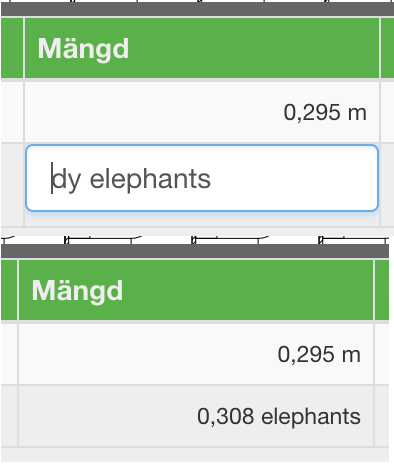 Units can now be overriden with text in Amount fields. First part will evaluate as formula, second interpreted as unit. Anything after the second part will be ignored.